For those in Europe and Africa, the total eclipse will unfold shortly before sunrise. For those in North and South America, the eclipse can be viewed at the beginning or in the middle of the night. The full Moon will be in the Earth's shadow from 03:34 GMT to 06:51 GMT. When the eclipse begins, a shadow will move in from the left, as if taking a bite out of the Moon. The total eclipse will last about an hour, beginning at 0441 GMT according to NASA. That's why a lunar eclipse is often called a "blood Moon." The red color is due to the same phenomenon that causes sunsets to appear pink, orange or red. "A little bit of sunlight is refracted by the Earth's atmosphere and reaches the Moon, bending around the edges of the Earth," explained Walter Freeman, an assistant teaching professor at Syracuse University's physics department. "This small amount of red light still illuminates the Moon enough for us to see it. Instead of being bright and white, the Moon will be very dim and red, 10,000 or so times dimmer than usual." Although total lunar eclipses happen, on average, about one to three times per year, after this one there will be a gap of three years until another is visible. "It's the last chance for a little while to see a total lunar eclipse," said Bruce Betts, chief scientist at The Planetary Society. The next total eclipse will be visible from Europe on May 16, 2022. 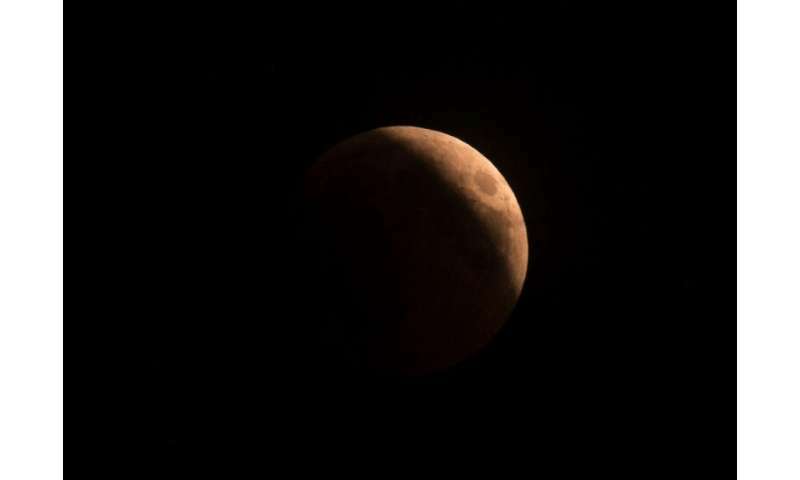 Some partial lunar eclipses will happen in the meantime. Total eclipses happen only when the Earth moves precisely between the Sun and Moon. Cloudy weather can interfere with viewing, but experts say that unlike in the case of a solar eclipse, there is no need for special eyewear to step outside and view a lunar eclipse. That's because the Moon does not produce light of its own, but only reflects the Sun's light. "The Moon is never bright enough to hurt our eyes like the Sun is," said Freeman. "A blood Moon is one of the few opportunities we have to see both the Moon and the stars in the sky at the same time, since the Moon is usually too bright."